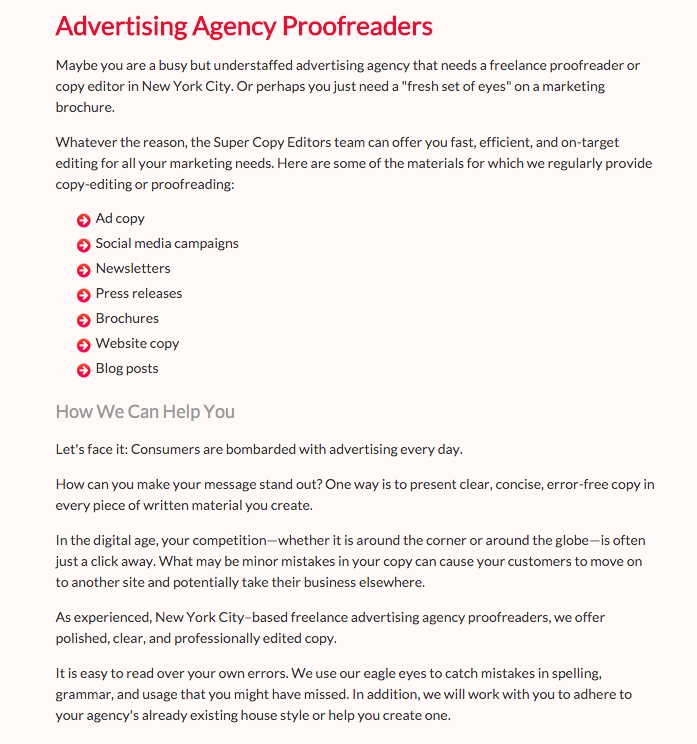 At Super Copy Editors we’re totally obsessed with using our deep knowledge of grammar, language, and communication to help our clients get ahead while saving them headaches, time, and money. We work daily with a wide range of businesses, but we have a particular passion for three key areas: advertising, marketing, and education. 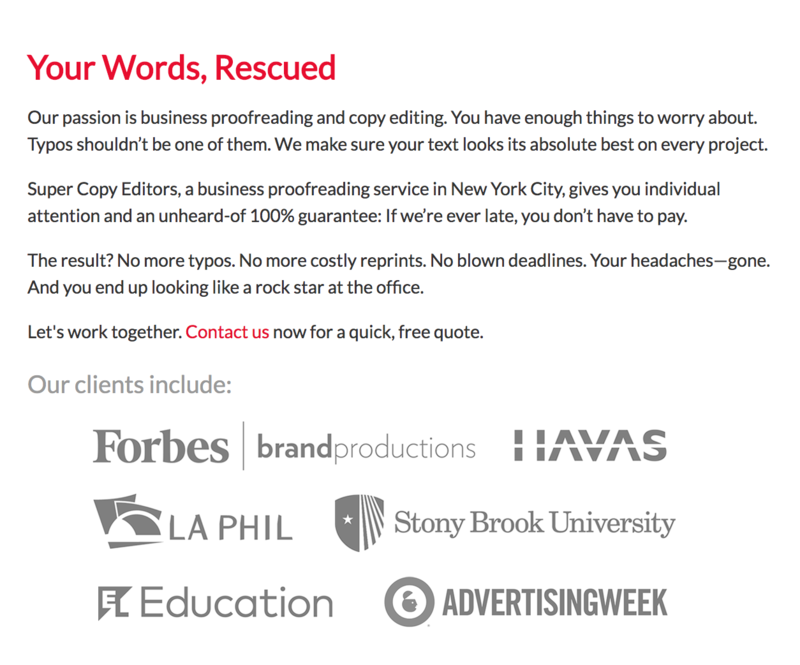 If you work in one of these fields, our copy editing and proofreading services are definitely the perfect solution for you. I am a former newspaper copy editor who can handle many editing styles, including: APA/MLA, Chicago Manual of Style, Associated Press, and New York Times. Of course, I can adjust to any specific local style you may have. I speak English and a little Spanish. My team is now able to proofread Spanish content. Adept at Word and Excel. Extensive experience with InDesign, InCopy, QuarkXpress, Photoshop, PageMaker, PowerPoint, Illustrator, Harris & CCI pagination, and many other word-processing and pagination programs. Microsoft Word, Photoshop, Illustrator, InDesign, InCopy, Quark, Adobe Acrobat. I have a Mac and a PC! I have a scanner. Two Pulitzer Prizes for staff efforts during Hurricane Katrina at The Times-Picayune (shared by staff). Three individual Awards of Excellence by the Society for News Design in 2006 for Hurricane Katrina coverage. 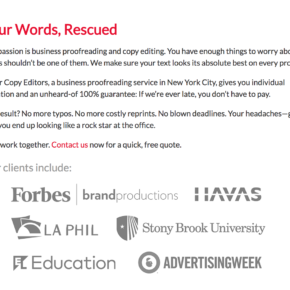 As experienced, New York City–based freelance advertising agency proofreaders, we offer polished, clear, and professionally edited copy. We work with ad agencies every single day, delivering well-polished work on very tight deadlines. Give us a try! Even seasoned screenwriters benefit from the services of a professional editor. 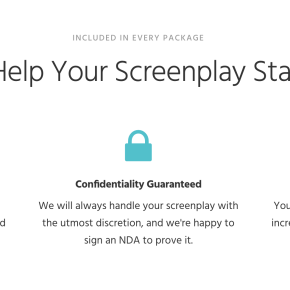 Our passion is to help you get your work produced, and we will work tirelessly on editing, proofreading, and offering suggestions for improving your screenplay. Over the past few years, the experienced team at Super Copy Editors has been entrusted with reviewing millions (no, literally, millions) of words of educational materials. Our seasoned copy editors include former teachers. 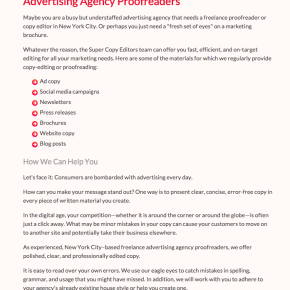 Why have so many curriculum designers and education publishers come to rely on our team of copy editors and proofreaders? Because we are sticklers for details, and we work quickly and efficiently. Give us a try!